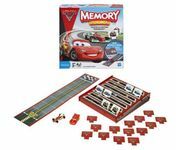 Flip the Cars 2 cards over two at a time to match and collect pictures of lightning McQueen and his pit crew. If two of the same character pictures are found in one turn, the player can keep them and continue with their turn. The cars crew shifts into gear for another high-octane adventure in 2011 with Cars 2.